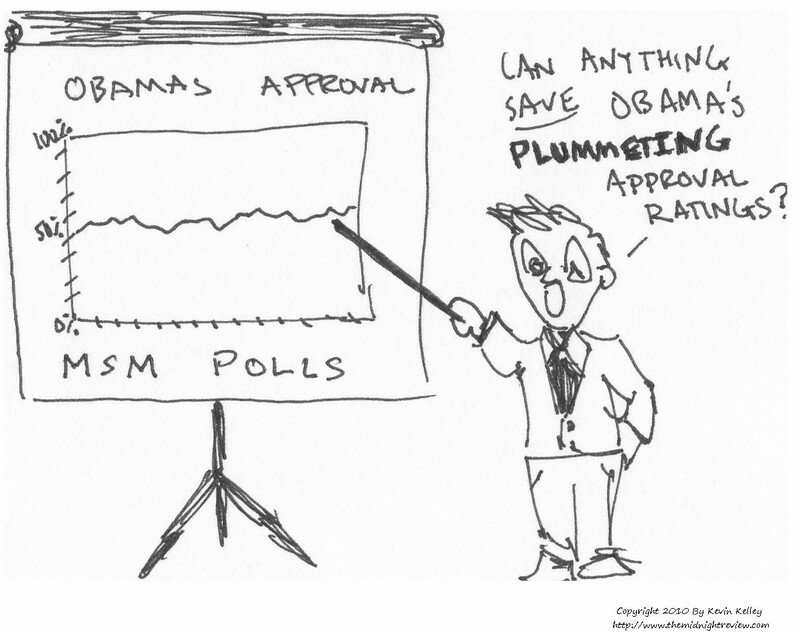 The Midnight Review: Obama Steady At The Polls. Why? I notice that right-wing media sources constantly refer to the President's approval rating, pointing out that there are plenty of people who disapprove or that he has hit rock bottom. John Smithson made a short post on Sunday pointing to a Rasmussen poll that showed Obama's approval ratings at 42 percent the day Rep. Joe Barton apologized to British Petroleum, calling their escrow account a "shakedown." Smithson then pointed out that the approval ratings were at 43 percent two days later, indicating that people don't care about Barton's apology and are still upset that Obama "thugged" British Petroleum. Smithson could not be more wrong, and trying to indicate the national mood by pointing to two days of polling by a single pollster is just irresponsible, but of course Smithson is very biased and he constantly publishes his propaganda because of his hatred for the president. There was an article by Steven Schier of The Atlantic that discusses why Obama's approval ratings have remained constant for months, and it isn't because people think British Petroleum got "thugged." Checking realclearpolitics.com's presidential job approval index of major polls, Obama's job approval on June 18 stood at 48.1 percent, virtually equal to his 47.9 percent rating on April 23, the day of the spill. His disapproval rating has also changed very little on average, moving to 47.4 on June 18 from 46.9 on April 23. Tom Bevan at realcearpolitics.com notes that on specific questions regarding the oil spill, Obama's rating has shifted recently in a decidedly negative direction. So why isn't that reflected in his overall job approval ratings? 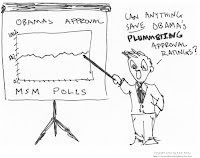 Smithson could learn a thing from RealClearPolitics - they came to their numbers by using a variety of sources, including Rasmussen Reports, which by the way shows Obama's approval at 46 percent. Rasmussen are tied with Fox News for showing some low-ball numbers, while almost everyone else show Obama's ratings closer to 50 percent. Using Smithson's method of using only one pollster, Rasmussen, it would appear that Obama's overall job performance raised 4 points since Barton's "gaffe." Schier also wrote that Obama's job approval rating had not reached the low numbers conservative saint Ronald Reagan had during the 1982 recession, when the new president had a 41 percent approval rating, according to a Gallup poll - Gallup shows Obama currently at 49 percent. The right-wing conservatives love to point out how the president's approval ratings keep dipping, but looking at all the numbers, his approval rating has actually been rather steady. Schier asks if Obama had reached the "floor of his job approval?" Two reasons suggest themselves. First, Obama has BP to thank for his job approval stability. BP has primary responsibility for the spill and response, and the blame is readily shifted to them -- as Obama has done. A large multinational corporation is a convenient presidential punching bag. The public has by now learned much about the spill and apparently had decided that Obama does not merit sufficient blame to deserve lower job approval. Contrast that pattern with the Iraq war, in which George W. Bush was the instigator and held direct responsibility in the public's mind for the conflict and subsequent occupation. As the bloody occupation drug on, citizens fixed blame squarely on Bush. Political scientist Alan Abramowitz performed a recent analysis of Bush's job approval ratings and found that his handling of Hurricane Katrina did not accelerate the decline in job approval that had already set in during early 2005. Rather, the increasing job disapproval proceeded at the same pace as before Katrina. The hurricane may have kept the trend going, but the trend began before Katrina and persisted long after Katrina. That points to the conduct of the Iraq occupation as a more likely cause of the decline. Second, citizens have many grounds upon which to judge a president's conduct in office, and the BP spill, with Obama's attenuated responsibility for the disaster, seems not to be determinative among all of the factors an individual might consider in weighing a job approval verdict for the president. There's also the economy, Afghanistan, Iran, North Korea, health care, and a variety of other issues that may figure into an individual's calculations.